And is sent within one week of an earlier message in the thread. With this change, we’re adding the requirement that an incoming message’s Reference header, if present, must reference IDs of previous messages in order to thread (see image below for example). This means that if you receive two emails with the same subject from the same sender, these emails will not be threaded together unless one explicitly references the other. This change helps to make sure that messages are only threaded when there is a definite relationship between them. End users: No action required. You’ll see these changes roll out on Gmail on the web and on mobile apps. 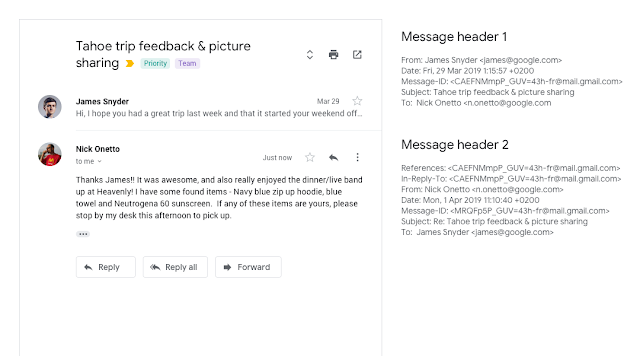 Additionally, if you don’t want your messages to be threaded in Gmail, you can either have different subjects or send each message with a unique References header value that will never match another message.